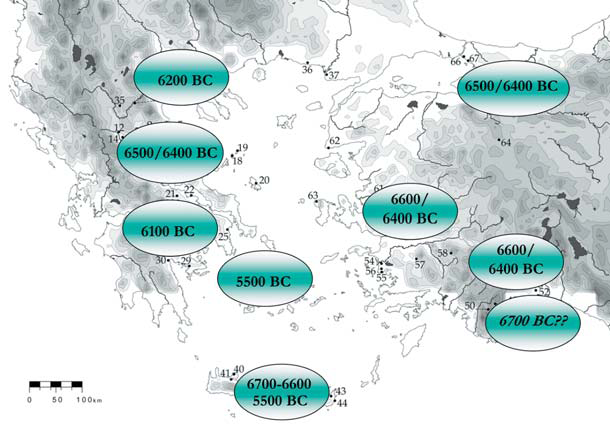 Marnie's blog points today to a very interesting review of the Early Neolithic Aegean. It is from a few years ago and hence totally oblivious to the archaeogenetic information that we are now familiar with. It is however surprisingly consistent with it. ABSTRACT – The Neolithisation process is one of the major issues under debate in Aegean archaeology, since the description of the basal layers of Thessalian tell-settlements some fifty years ago. The pottery, figurines or stamps seemed to be of Anatolian origin, and were presumably brought to the region by colonists. The direct linking of the so-called ‘Neolithic Package’ with groups of people leaving Central Anatolia after the collapse of the Pre-Pottery Neolithic B resulted in the colonisation model of the Aegean. This view is not supported by results obtained from natural sciences such as archaeobotany, radiocarbon analyses, and neutron activation on obsidian. When theories of social networks are brought into the discussion, the picture that emerges becomes much more differentiated and complex. Fig. 9. First appearance of Neolithic sites in the Aegean. The overall picture that the author defends, which needs of course not to be the last word but is indeed interesting and well argued, is that of a relatively gradual transition from Epipaleolithic to Neolithic via maritime influxes, which obviously imply partial colonization but quite apparently assimilation of at least some of the pre-existent hunter-gatherer peoples in Greece (no evidence so far of Epipaleolithic or Mesolithic in West Anatolia). The oldest sites are in the Southern Aegean, with Crete and the Lake District, and date to the first half of the 7th millennium. They are followed by the Central Aegean sites in Thessaly and Western Anatolia, while the youngest sites were founded at the end of the 7th millennium in the Northern Aegean (Fig. 9). Astonishingly, in the Argolid, where there was a strong Mesolithic presence, long-lasting settlements appear comparatively late, around 6000 BC. The islands, as well as Crete, were (re)inhabited continuously only after 5500 BC. After a detailed examination of both the material culture and 14C dates, the model of a wave of colonisation sweeping over the Aegean as a whole must be rejected: that is, sites appear there at different stages in different landscapes. The author then argues that only Knossos (Crete), Argissa and Sesklo (Thessaly), Ulucak (West Anatolia) and Bademagacı (Lakes Region of SW Anatolia) remain as well dated Early Neolithic I sites in the whole region. Addint that: "interestingly, the sites in the Lake District are older the closer they lay to the sea", possibly supporting a coastal migration model. Therefore, the modelled 14C dates do not support the idea of direct colonisation from Central Anatolia, but testify to a marine-oriented population living in this area in the transition to the EN I.
Reingruber argues for Aegean networks originally dating to the Epipaleolithic (aka Mesolithic) and at least partial continuity from those pre-Neolithic peoples, something that would seem supported by the most up-to-date ancient genetic data, which suggests around 50% Paleo-European ancestry, possibly from the Balcans, in the "purest" early european farmers (EEF) such as samples from LBK or Starcevo, even before additional admixture happened towards the West. With this concept of regional and supra-regional networks based on the mobility of prehistoric people I do not argue in favour an exclusively autochthonous Neolithisation model. The input of the Anatolian/Near Eastern way of life in the Aegean is obvious. Many of the products and also the items used in symbolic activities were of Anatolian origin. Nevertheless, as has been shown, the Aegean ‘Bauplan’ displayed other priorities, the material culture differing from region to region. What I wish to stress is interaction based on face-to-face contact, on integration and social competence. Also a precise examination of the 14C dates argue against a demic movement ignited by a catastrophe at the end of the PPNB (compare also Thissen 2010.278). Worth very much a full read anyhow. I just can provide here a glimpse after all. Funnily enough I just read this paper. Quite convincing. A couple of questions. What is the "most up-to-date ancient genetic data, which suggests around 50% Paleo-European ancestry, possibly from the Balcans" relating to early farmers? Do you have a reference for this? Catherine Perles argues in her book that the Starcevo (etc) and Thessalian Greek Early Neolithics are only related by association through Anatolia and not by direct interaction/migration. If this were true would this mean that any aDNA data from north of Thessaly would not help answer the problem of Thessalian Greek origins? Please disregard the figure "around 50% Paleo-European ancestry". It was based on some ADMIXTURE analyses (can't recall the source) but current data rather suggests 25% WHG-like fraction (relative to Levant populations) only or, if we use the new NW Anatolian sample (Mathieson 2015), a mere 10% extra WHG-like ancestry in early European farmers. The matter is not fully clear anyhow for lack of West Asian early Neolithic samples, this new NW Anatolian sample corresponds to a second phase of the Neolithic and chronologically overlaps with Thessaly's and other Greek first Neolithic, sharing probably partial ancestry but also surely implying some degree of backflow from the Balcans as well, as mentioned in this study, which underlines the trans-Aegean interactions. The exact fraction of Paleoeuropean blood in early European farmers is therefore unclear as of now but that there was some of it there is no doubt (Lazaridis 2014 called it "UHG": unknown hunter-gatherers but did not produce a figure). "Catherine Perles argues in her book that the Starcevo (etc) and Thessalian Greek Early Neolithics are only related by association through Anatolia and not by direct interaction/migration". I would rather think so but we must discern carefully, after all the new data, both archaeological and genetic, between Western Anatolia (probably more similar to Greek Neolithic) and South-Central Anatolia (Çatal Höyuk and such), whose relation remains unclear. I personally lean for a coastal migration from the pre-pottery Levant via Cyprus but contacts (and therefore genetic admixture) with South-Central Anatolians can't be just discarded. "If this were true would this mean that any aDNA data from north of Thessaly would not help answer the problem of Thessalian Greek origins?" The big blank of data is from West Asian Neolithic, without such direct references we can only speculate about the exact genetic makeup of those peoples, who are in one way or another clearly ancestral to European Neolithic. Wars and climate do not help but the climatic issue (that affects DNA preservation) has been breached in recent months thanks to the discovery of a "vault" of sorts in the petrous bone of the ear, so we must expect some data soon, at least I do hope so. If they can do it in Ethiopia, they can do it almost anywhere, if luck helps a bit. Thanks for your fullsome reply and the reference. Maybe as you say the floodgates of aDNA are about to open. It would also, as you say, be nice to pin Greek migrant influence down to Cyprus and the northern end of the Levant (my personal preference on no evidence). I suspect that it might be more of a mess than this.